The very mention of the sound sends shivers down your spine and fear into your heart. A survey from Cancer Research UK revealed cancer was more of a concern than contracting Alzheimer’s disease, being the victim of a crime, landing in an auto accident, or losing an income – especially for younger respondents. 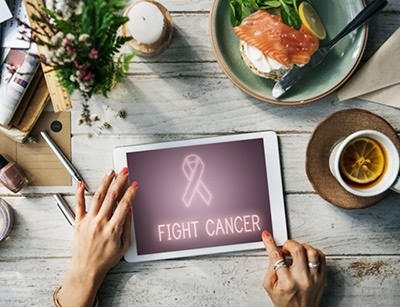 Knowing that cancer is such a dreaded disease, I simply typed “anti-cancer diet” into my search engine, and in .27 seconds came up 43 million “hits.” It seems sensible that people would want to know what to eat to prevent cancer. Although more than 70% of Americans are overweight or obese, reducing your risk of cancer may have less to do with what you’re eating than in how much you’re eating and moving. Obesity is a statistically vital risk factor for cancer. In fact, cancer is the fifth-most-common disease caused by obesity. Others ailments on the hit list include stroke, nonalcoholic fatty liver disease, cardiovascular disease and type 2 diabetes. The World Health Organization determined that obesity had surpassed hunger as the greatest worldwide threat. With the exception of sub-Saharan Africa, obesity rates shot up globally by 82%; the U.S. obesity rate is a staggering 35.7%. But they are dead wrong. There are things we all can control to lower the risk of cancer. And stay far away from anyone who does smoke. According to the National Cancer Institute, cigarette smoking causes an estimated 443,000 deaths yearly, including almost 50,000 from exposure to secondhand smoke. Canada, Columbia, Italy, Spain, and Ireland are just a few countries with strict national bans on indoor smoking. Yet, here in the U.S., each state has its own laws – even though it has been proved that secondhand smoke kills. Drinking to your health has quite the opposite effect. Excessive alcohol intake is known to boost your risk of cancer and other ailments. So, if you drink, limit your daily alcohol consumption to 2 drinks for men and 1 for women. Sedentary living moves the needle on your cancer-risk meter. According to Cancer.net, regular activity helps reduce the risk of cancer by preventing obesity, reducing inflammation and hormone levels, and improving insulin resistance and immune system function. Daily physical activity is associated with lower risk for several cancers, including breast cancer and colon cancer. Hippocrates, the man who is recognized as the father of Western Medicine, said, “Let food be thy medicine.” Although there is no individual food that can cure or prevent cancer, some foods can promote health – and some foods do detract from it. What you eat, and what you don’t eat can make a difference to your risk for cancer. By including foods that provide the best nutrition, and excluding (for the most part) foods that take up “stomach space” and crowd out nutrient-dense foods, you can maximize your health and minimize your risk for cancer. If it comes in a box or a can, it’s more likely to be processed – and that often means its nutrients have been removed while chemicals and preservatives have been added. Frozen vegetables and fruits remain beautiful choices. They are picked and frozen to preserve their freshness and nutrition. Enjoy them – as long as they’re not sauced or seasoned. By focusing on plant foods, we’re assured that we’ll get the most essential and life-sustaining nutrients possible. Deeply colored fruits and vegetables mean you’re getting high amounts of antioxidants such as beta-carotene; vitamins A, C and E; potassium, and selenium. Fiber, which is the indigestible part of plants that help keep you regular, is an anti-cancer food that can help lower your risk for cancer by speeding up the transit time of food waste through your system. High fiber foods include all whole grains (brown rice, oatmeal, air-popped popcorn, barley and whole-wheat pasta); all fruits (berries, apricots, citrus, raisins and prunes); all legumes (beans and peas); all vegetables (especially those in the brassica family such as cauliflower, kale, broccoli, and cabbage). Although some meat is fine for some people, others may be at a higher risk for colon cancer, so avoiding meat can decrease their risk of cancer. Everyone should limit processed meats like salami, bacon, sausage and cured ham because they’re high in fat and salt and generally contain preservatives and additives. Most Americans eat huge portions, and cook meat improperly –carcinogenic compounds are formed if you cook meat using high-temperature methods such as pan-frying or grilling directly over an open flame. This warning applies to the charring of beef, pork, fish and poultry, too. Try alternate lean meat “steaks” chopped from salmon, tuna and other fish. Hook up with some of your favorite celebrity vegetarians and experiment with tasty recipes. Enjoy your diet, eat better, and live longer! Previous articleHow Many Calories to Lose Weight?